You are reading this because either you should have brought a new roti maker or planning to buy one soon. Many of us have grown up seeing our mother making rotis the traditional way. But now times have changed. And many of us would like to use a roti maker which promises to make our work easy by flattening the dough as well as cooking it saving time and energy. Making dough it not a hard task. It can be done in five minutes - put the flour and water in a bowl and knead it into the right dough consistency for roti maker. But the real challenge lies when we actually start rolling out the rotis. There are times we would probably have irregular shapes that we could maybe pass off as the outline of a yet undiscovered continent. Take wheat flour in a bowl and add a little salt to it. Mix them along with little amount of water. And two to three tbsp of curd for making the rotis extra soft. Mix them all together. Now add more water to the mixture until you get a dough which is a little loose than normal traditional mix. Now, add one to two tablespoon of oil and mix it again. Finally, knead for few minutes time, cover it with a cloth/lid and place it aside for an hour for the gluten strands to form and for the roti to be soft and perfect. When you’re kneading it, remember to ensure that the dough is a little looser than you’d normally make it, to allow it to be easily flattened. Any roti maker online, like the ones on Rediff.com, will need the dough to be kneaded this way because no machine is as flexible as human hands. Roll your dough into small balls, no larger than a lemon, then flatten them slightly. Dip them in a little flour so both sides are covered and set them aside. Switch on the roti maker now and wait for it to heat up. Then, place one of your flattened portions of dough and use the handle and top of the roti maker in quick succession to flatten it out. This can be a little tricky, so don’t be discouraged if it doesn’t happen right the first time. Wait for the phulka to turn slightly brown on one side with small bubbles coming up before flipping it over. Then do the same for the other side, and flip it over one more time. The phulka should now puff up, and you can take it off the roti maker. The below YouTube video will serve as a guidance. To make a paratha, all you have to do is knead the dough as usual, just slightly looser (like you had to for the rotis). Then roll out the dough balls and flatten them slightly again before placing them in the roti maker. Press the top down on your dough, but not as hard as you would for a phulka. You need your paratha to be sufficiently thick, and pressing too hard could squish out your fillings. Fry one side till it starts firming up, then flip it over and rub a few drops of ghee on the paratha. Again, wait for a bit and flip it over again before rubbing a little ghee on the other side. Frying a paratha on a roti maker takes less oil than on a tava, so all you’ll need is a few drops of ghee at most. Keep turning it over every few seconds till the paratha is golden brown and cooked through. So there you have it. Perfect, round rotis and comforting parathas, all from the very convenient roti maker. Remember the dough consistency is the secret behind the Electric Roti maker success. 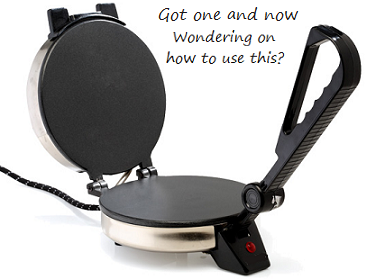 Have you used Roti Maker? What is your thought on it?